A steam powered car, but also the most awesome car, ever. 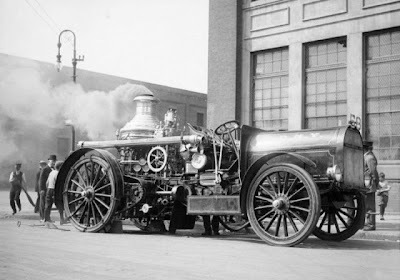 *A commenter notes that this is a fire truck, with an ordinary motor in front and a steam boiler in back to generate pressure for the fire hose. This is a modernization of a horse drawn steam pumper fire engine that mates the pumper to a truck chassis with an internal combustion engine. So the boiler on the back runs the pump? Yup. Here's a picture of the original horse drawn form.